Make Modern is a new on-line magazine coming from Australia. In fact, it's Australia's first modern quilting magazine. It's a gem! The first issue release date is September 1, 2014. Living on the East Coast of the United States, the message that the magazine was ready for download dropped into my e-mail mid-morning, yesterday, August 31! It felt like I'd gotten a bonus day! This magazine is awesome. It includes 14 projects and I could happily make most of them. 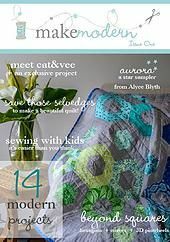 There are fabulous foundation patterns, patterns for pre-cuts and an appliqué pattern and a quilt sampler of star blocks, designed by Alyce of Blossom Heart Quilts, to make over the course of the year (6 issues). And they are also including one project each month to teach children (or absolute beginners) to sew-- I think that is brilliant! The quilt, "Pavement Puddles", on the magazine cover is hexagonal pattern designed by Melissa Gottliebsen. I about fell off my chair when I looked at the pattern directions and saw that it's a jelly roll quilt! A 2.5 inch strip quilt that doesn't look like one--Finally!! I have a couple of rolls languishing in my stash due to lack of enthusiasm about any of the patterns I have. There is about to be one less roll in my bin! All of their contributors are making beautiful quilts. Kristy Lea designs beautiful, intricate paper pieced patterns. Here's a link to her free paper pieced pattern for the word "Create." She blogs at QuietPlay. I really enjoyed the article about the quilt "Memory Cats". Jo King, using Elizabeth Hartman's The Cat pattern, is making a record of all the quilts she has made. She makes a cat with scraps from each of the quilts! She says she is still a few blocks shy of having a whole quilt! There is also a great article about the ins and outs of using Instagram to connect with other quilters. In fact, Instagram is the reason I know about this magazine. I've posted quilts on IG with the tag #modernquilts and the magazine started following me. Of course I had to check them out! There are blog and website links for all the contributors, both at the beginning of the magazine and at the end of each article. Start reading and clicking and you might never be able to put your tablet down! The magazine is 110 pages. A single issue costs $10 Australian (the Australian dollar exchange rate is nearly equal to a US dollar, give or take a few cents difference). You may also buy a subscription for 6 months (3 issues) or a year (6 issues). The year subscription is $50. That may seem expensive for a magazine. However, I would have happily paid $10 for the "Pavement Puddles" pattern. If each issue is a packed with great ideas as this one, it will definitely worth it. Subscriptions you buy now will start with the November issue. But you can purchase single issues and Issue One is available now. Not ready to commit to a subscription? Check out their Face Book page and the Make Modern Blog. During the month of September, Make Modern's blog is hosting a blog hop where you'll get to meet the their contributors. Looks like a lot of fun! Check out Make Modern Magazine! You'll be glad you did. Note: I don't have any financial affiliation with Make Modern Magazine. I'm just a throughly delighted reader! !